At some point, the boom had to have boomed. We are moving into the past tense for all this now, inflation hysteria almost certainly tucked away into the economic ledger alongside four other false dawns. Data is coming in for June 2018, meaning half of this year already recorded and analyzed. It’s not what it was supposed to have been. Even in terms of inflation, there are only regrets. The US CPI registered 2.87% year-over-year last month, but for still another month there is nothing else but energy inside that number. There is what may seem like an unfair (from the point of view of central bankers) asymmetry to oil. When it’s down that’s deflation and often consistent with the textbook description of what accompanies it. When it comes back, however, it doesn’t necessarily mean the opposite thing. 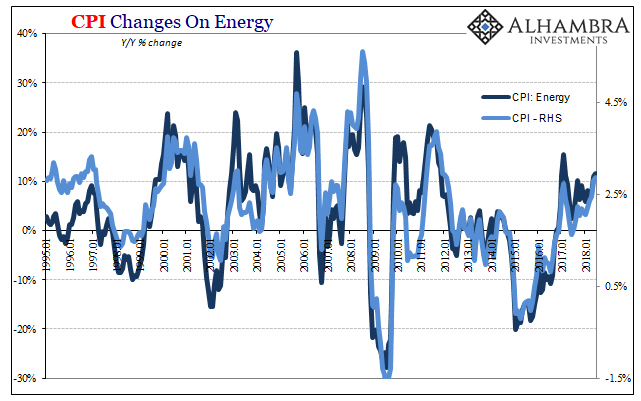 At times, like 2010 and 2011, it merely means oil isn’t at the bottom any more. 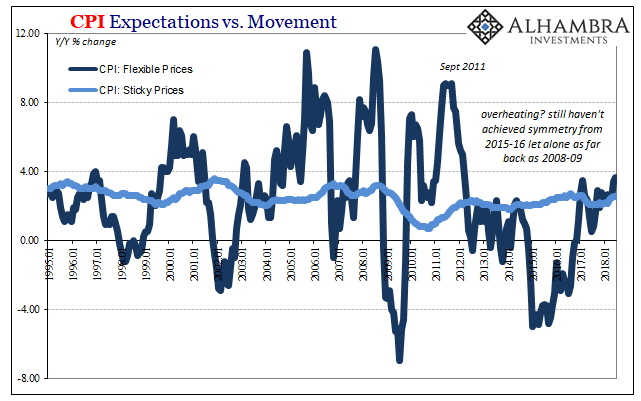 That may mean this crucial commodity has completed the first step in reflation, but at the same time it also doesn’t guarantee the required second step. The reason economists fixate on consumer prices and define inflation as they do is because there is intuitive sense. The key word in their definition is “broad”, as in not narrow. Coming back up off the low, WTI hasn’t been corroborated by anything more than overheated rhetoric. 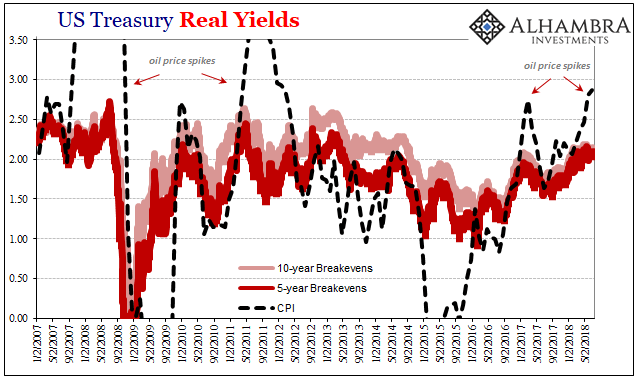 The most that should have been said during the inflation hysteria is that oil prices were plausibly suggesting an inflationary breakout could still happen, not that it would or as many were saying already had. What has been required was confirmation beyond crude. It just hasn’t been forthcoming, notably in the labor market. 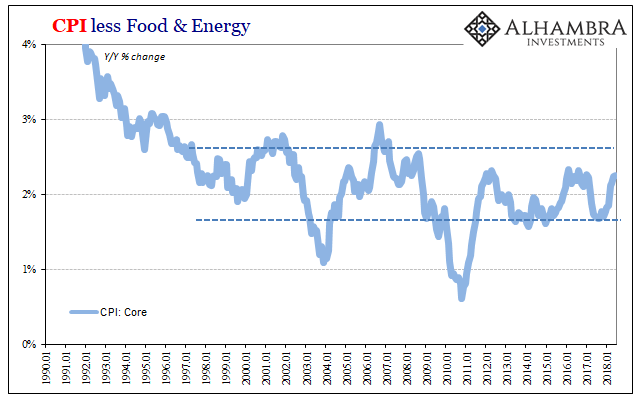 Even among inflation measures, core rates and such, there was just no evidence of “broad” acceleration in anything. WTI has been the lonely star. The boom didn’t boom and more and more that isolation grows fanatical (though not the past few days). Oil prices are now being directly opposed by very important financial prices and indications. 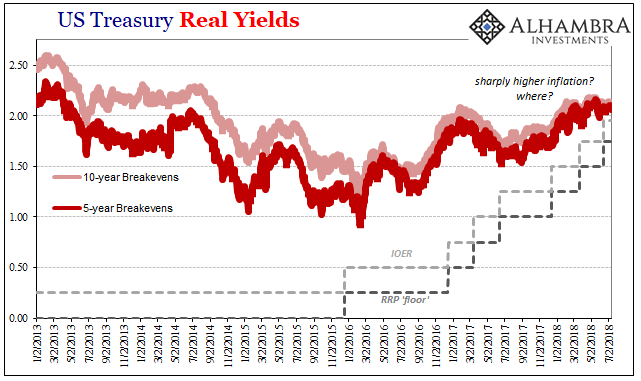 Copper is down, gold, too, the eurodollar curve inverted, and global bond markets are getting that same deflationary itch we’ve seen four times already through the last eleven years. This is how on a day when the CPI reaches the highest level since February 2012 nothing of any importance is moved by that fact. We’ve seen this movie before. Since history rhymes rather than repeats, it is interesting to note how much of different parts of the “recovery” period is evident in different ways of late. In 2018, there’s the more obvious growth ceiling of 2014 combined with the burgeoning EM currency signal of 2013 coupled to the 2011 inflation head fake. The Fed may not have been raising rates six years ago to curb that last one, but both the ECB and PBOC were. 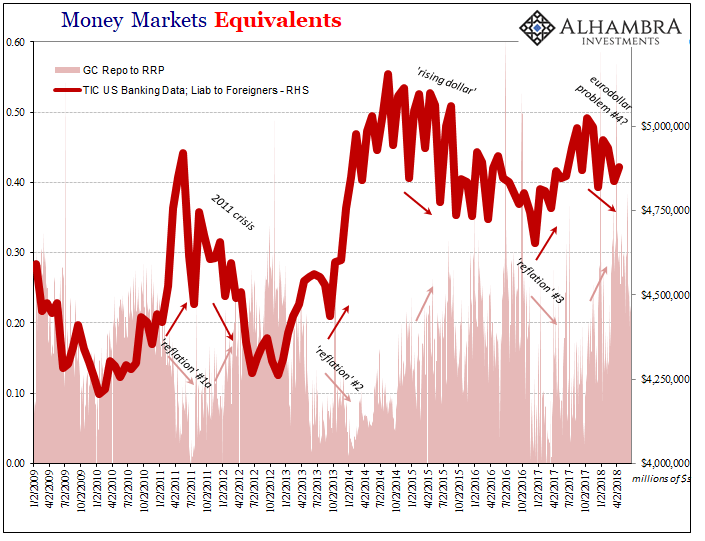 Of all those possible factors, it’s the recalling of 2011 that is likely on the minds of UST traders (meaning large banks who have prime interest in liquidity risk, of the practical rather than theoretical kind). 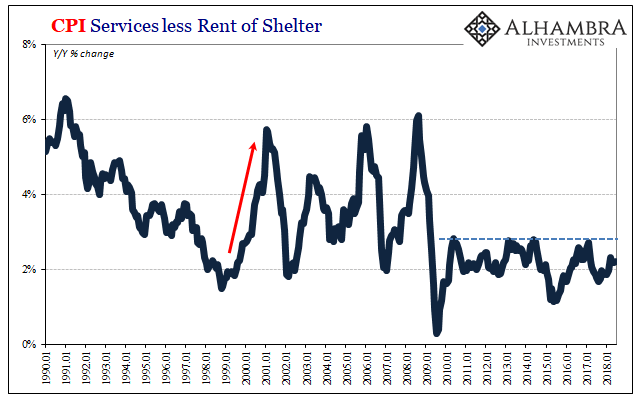 The world, they were told, had a CPI problem back then only it wasn’t solved by “rate hikes” against the economic backdrop of an actual boom. 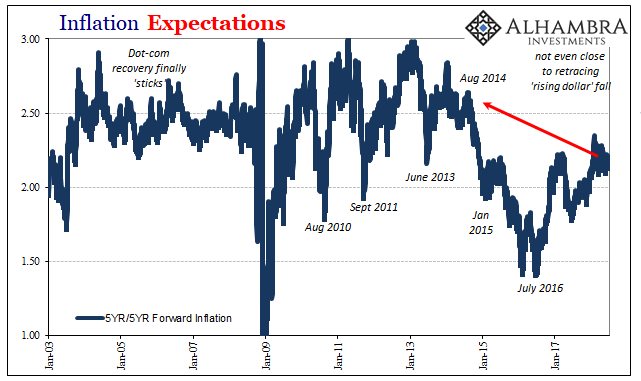 The temporary inflation of 2011 was made temporary by another tightening of the eurodollar noose, the second to that point. We are staring into the face of a fourth. Jerome Powell thinks it the Fed’s job to get ahead of inflation. The markets are starting to think that’s already being done for him. Again.